There's a reason why Rylie Mills is being recruited by close to 25 Division I programs. Put simply, he's a game-changer. Mills, a four-star 2020 defensive end from Lake Forest (Ill.), was offered by Ohio State on May 14. Since, his recruiting process has only ramped up. "I visited OSU in July this past summer and I really liked how invested they were in preparing for after college," Mills told Eleven Warriors. "How high-level football they play, how serious they are about academics ... I learned a lot from the visit. As of right now, I’m still trying to get the most information I can from every school." Mills, who's ranked as Illinois' second-best overall prospect, says he's been in contact with Urban Meyer, Larry Johnson and Greg Studrawa and that all three have made it clear that he's a priority for the Buckeyes. "I'd say that I have a large frame and can play on the inside very well, but I'm also quick and can play in a five-technique and rush the passer," Mills said, when asked about his strengths. "I have taken a couple visits to other schools. I really liked Ohio State's atmosphere and how involved everybody was." If you've been paying attention, you certainly know that Lexington's Cade Stover has carried the Minutemen to multiple wins this fall. The 2019 Ohio State commit and four-star linebacker recruit has helped his team on both sides of the ball while striking fear into opponents. Tuesday, he was named as an All-USA Midseason Defensive Player of the Year candidate in the Midwest region ... and for good reason. Through eight games, Stover has 121 tackles (!! ), nine for a loss, and two interceptions ... and that's not including the impact he's made on the offensive side. Stover is up against Michigan commit Mazi Smith (East Kentwood, Mich.), Purdue commit George Kariaftis (West Lafayette, Ind. ), Michigan State commit Julian Barnett (Belleville, Mich.) and Notre Dame commit Jacob Lacey (Bowling Green, Ky.). You can vote for Stover here. The wide receivers coach position at Ohio State has been ... well, well-documented over the past three months. 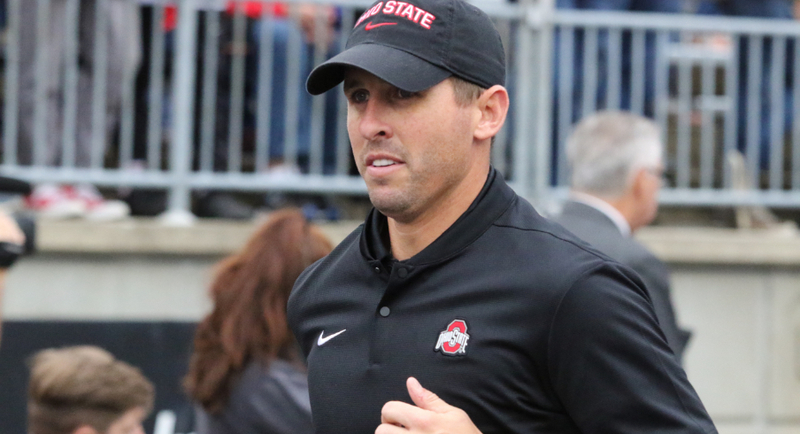 But many will agree that when Brian Hartline became the interim wide receivers coach, taking over for Zach Smith in the wake of controversy, the Buckeyes' current and future receiving corps inherited an instant upgrade. Hartline is well-like by many of the Buckeyes' top receiving recruits, namely prospect Wandale Robinson (Western Hills, Ky.) and commit Jameson Williams (St. Louis, Mo.). Hartline was asked about how he approaches recruiting Wednesday evening during media availability. We all see why he's well received by Ohio State's future wide receivers. The group is in good hands. In case you were wondering — and after you see this graphic, you may not want to wonder anymore — Penn State leads the country in individual state's top 2019 recruit commitments. The Nittany Lions have verbal commitments from Virginia (Louisa County's Brandon Smith), Oregon (Sheldon's Michael Johnson Jr.), Delaware (Smyrna's Saleem Wormley) and Pennsylvania (North Allegheny's Joey Porter Jr.). That information is based off of 247 Sports' rankings, but should still send a shiver down your spine ... especially considering that Ohio's top recruit, Olentangy Orange's Zach Harrison, is considering Penn State as well. The Nittany Lions are followed by Georgia with three top-state recruits while Michigan, Nebraska, Oklahoma and Wisconsin all come in with two. 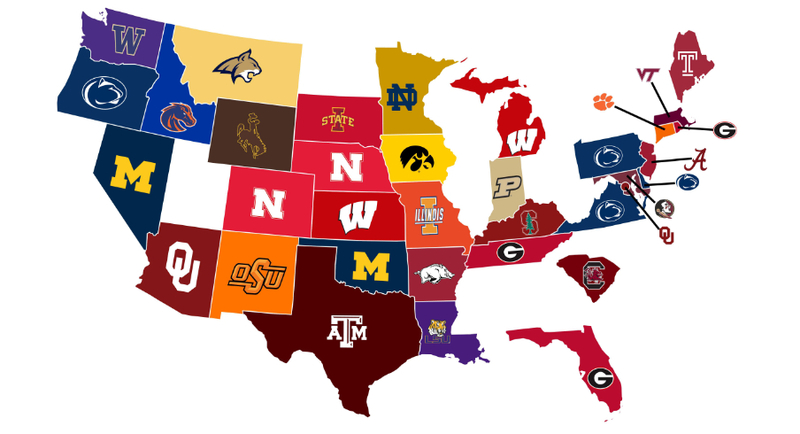 Meanwhile, the highest-rated players within their states belonging to Ohio State's 2019 class would be Lake Travis (Austin, Texas) wide receiver Garrett Wilson, Cardinal Ritter Prep (St. Louis, Mo.) wide receiver Jameson Williams and Spring Valley (Huntington, W. Va.) guard Doug Nester. All three are ranked as the second-best players in their states.